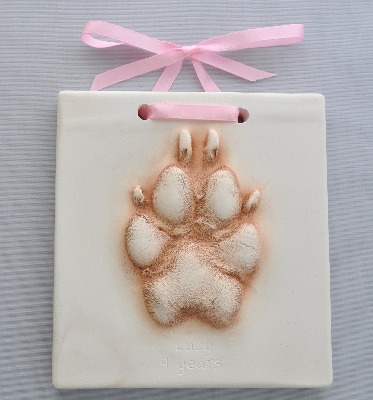 This is a paw print from a Labrador Cross, it can also be framed £125 or finshed as a hanging impression with a choice of ribbon in white, pink, blue, green, grey or black. Pet impressions are usually taken at the pet owners home. Extra small hanging impression £70, an be framed in shadow box frame £90 or standared frame £125.